You'll be £12.99 closer to your next £10.00 credit when you purchase Birth, Marriage and Death Records. What's this? Authors David Annal and Audrey Collins guide researchers through the difficulties they may encounter in understanding the documentation. They recount the history of parish registers from their origin in Tudor times, they look at how civil registration was organized in the nineteenth and twentieth centuries and explain how the system in England and Wales differs from those in Scotland and Ireland. The record-keeping practised by nonconformist and foreign churches, in communities overseas and in the military is also explained, as are the systems of the Isle of Man and the Channel Islands. Other useful sources of evidence for births, marriages and deaths are explored and, of course, the authors assess the online sites that researchers can turn to for help in this crucial area of family history research. As seen in FAMILY TREE. As seen in Dorset Magazine. Throughout the authors adopt a lightness of touch enlivening the story with human detail about personalities behind the legislation. Illustrations are apt and enliven the text. This is no dry as dust work, but an essentially readable and approachable book which provides a wealth of useful information to ensure users gain the maximum benefit from the sources. All you need to know about birth, marriage and death for tracing family history. Covering parish and non-conformist registers as well as the records of civil registration, this book is a thorough guide for those researching British ancestors. Full of fascinating information, including why there are so few Catholic parish records extant before 1820, Isle of Man records, a chapter on Scotland and very useful pointers re military births, marriages and deaths. This is a very accessible introductory volume to a key subject or family historians. Beginning with a history of the motives for the introduction of such records, the authors explain how record systems evolved and how they can be accessed, explored and interpreted. From the history of parish records we are taken through the different types of records that exist for England and Wales, Scotland, Ireland, the Channel Islands, the Isle of Man, foreign churches, non-conformists, military sources and other topics including divorce and adoption. An appendix details relevant legislation from 1538 to 1926 and there is useful bibliography. An introductory guide for the uninitiated, Dave Annal and Audrey Collins’ introduction to the holy trinity of family history resources takes BMDs by their horns, explaining and elucidating how documentary evidence of these three junctures in our ancestors’ life can be used in our pursuits of genealogical knowledge. This easy-to-read introduction to these crucial resources for family historians will help you to understand why these record keeping systems were created, how they evolved and how they can be explored and interpreted today. Professional genealogist David Annal and Audrey Collins, a family history specialist at The National Archives, have joined forces to expertly guide readers through this fascinating subject, examining the history of parish registers and civil registration in the 19th and 20th centuries, and explaining how the English and Welsh system differs to those in Scotland and Ireland. Other useful sources are looked at too such as Nonconformist and military registers plus overseas and ‘at sea records. Also covered here are systems in The Channel Islands and the Isle of Man, divorce and adoption, and of course, online access, giving you a comprehensive overview of the subject and perhaps new research leads to follow. Other useful sources of evidence for birth, marriages and deaths are explored and, of course, the authors assess the online sites that researchers can turn to for help in this crucial area of family history research. David Annal and Audrey Collins have written a very comprehensive guide to their chosen subject and discuss in detail all available sources. The book is a most thorough study of its subject. ..it is a great resource for the more advanced genealogist, or those wishing to their understanding go the subject further. This guide acts as an introduction into understanding historical documentation. It gives a great amount of information concerning the creation of the record keeping system, including foreign churches and overseas communities. The authors provide extensive material concerning the original motives for registering the milestones in individual lives and they also give useful websites to explore. 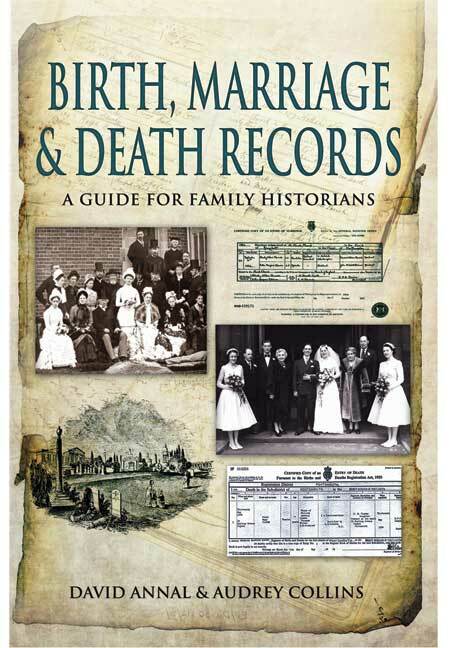 This books is one of the best guides I have seen about the important subject of finding birth, marriage and death records. It covers civil registration, parish records and nonconformist registers in great detail but also looks at how to use less commons sources to find your ancestors. These include military sources and chapters covering Irish and Scottish records. If you are trying to discover how to access records when someone was adopted or divorced, you will find information about how to get started and what records may survive. I would recommend this book if you want a good reference book. The book covers all the well-known resources such as parish registers and civil registration and also includes non-parochial registers. There are interesting chapters on military and information about overseas registers. Scotland, Ireland, the Channel Islands and Isle of Man are included. The book is written in a lively, interesting way which makes it very readable and it would be a useful addition to any family historian’s bookshelf. David Annal has been actively involved in family history research for over thirty years. He was employed by The National Archives for ten years and has worked as a professional researcher since 1984. He is the author of a number of best-selling family history books and is well known as a columnist and a speaker. Audrey Collins works as a family history specialist at The National Archives, and has researched extensively into the history of the General Register Office of England and Wales. She has a degree in history and politics from the University of Warwick, and was a freelance researcher, speaker, teacher and writer on family history before joining The National Archives in 2002. .